Featherwind / Nutmeg Build: Launch Day! Woohoo! 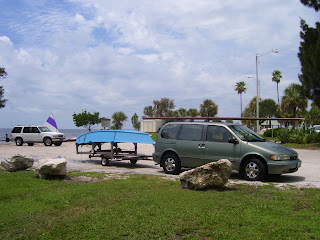 Here we are at Sunset Park the local beach/boat ramp with the boat on the trailer. The mast is on top of the van and all other equipment is in the van. I started building the boat a little over a year ago but was out of state working for seven to eight months, so figure a net total of maybe six months build time. To first step is to remove the boat from the trailer. I slide the boat half way off the trailer and set one side of the boat down on the ground on top of a heavy mover's quilt. Next time I'm going to set it on the floatation cushions and leave the quilt at home so there's one less thing to bring. 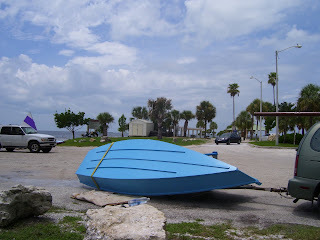 The photo shows one side of the boat on the trailer and the other on the ground. From this position it's easy to roll the boat over to the upright position. 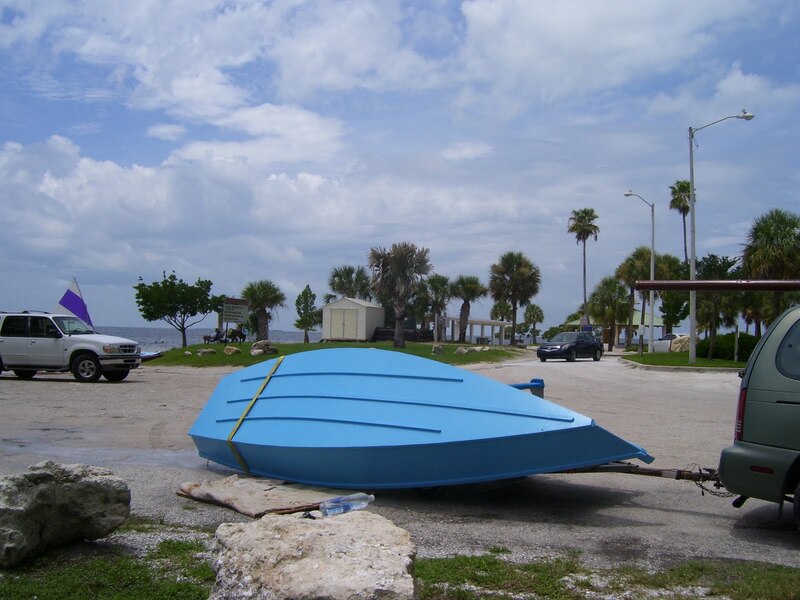 This photo shows the boat rolled over to the upright position with the wheels slid under the bow. From here I lift the boat up at the aft end and roll it to the waters edge. 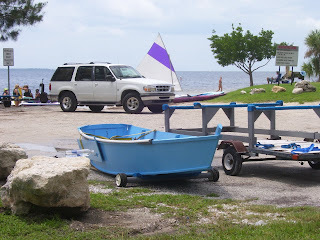 I prefer this method of getting the boat to the water over backing a trailer into the water and find it relatively easy to do although I wouldn't want to do it with a heavier boat. The sail in the back ground is a from a Sunfish sailboat. It hits the water for the first time. Wow it Floats! Only a few inches draft, pretty cool. Since it doesn't leak I decided to move along and get it rigged it for the first sail. Here's a close up photo of the dragon head mounted on the bow. Are you crunchy? Do you taste good with catsup? Beware of the Dragon! So my ma and girlfriend piled into the boat with me and we took her out for a spin and had a nice little ride. A Sunfish tagged along to keep an eye on us in case of a problem. Nice of him, he did that on his own initiative. With three of us in the boat it handled fine, moved well, and seemed to point well enough. Coming about seemed slow but it may be that I need to get more familiar with the nuances of this boat. Overall, the boat seemed good and it was great to get it out on the water. This photo shows me sailing solo. When I sailed the boat solo I found out that my weight alone is not quite enough to balance the sail/mast weight. Yes, that means I dumped it twice. :) Luckily the water was shallow enough for me to walk it back to shore and bail it out. With three people aboard there was no problem keeping it upright. 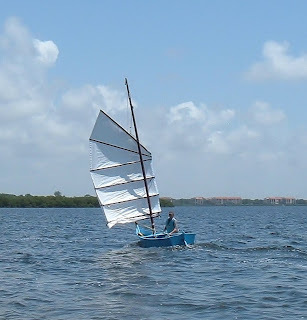 I have a few options... Lighten the junk rig mast/sail, add amas so it's trimaran, and or try out the lighter lanteen mast/sail that is suggested in the plans. What might be cool is to build removeable amas so I could sail it as a trimaran or a mono hull and use either the lanteen or junk rig sail/mast. I could sail the boat in a couple different configurations. We'll see, thinking about it for now. The very next thing is to try to add floatation in such a way as to make the boat recoverable from a knock down.